The Chinese character to the left is our last name, Gee. The literal meaning of the character is vermilion, which is a red color (hex triplet #E34234) that is also called cinnibar. Because of that definition, vermilion is the primary color incorporated into the design of our web site. In other dialects of Cantonese, it can also be pronounced Chee or Chu, so you will sometimes see families with those surnames using the same character. In Mandarin, it is romanized as Zhu (but pronounced like Ju with a long U sound; zh in the pinyin romanization is pronounced like a j). As of 2006, this is the 13th most common Chinese surname. Ron grew up in Long Beach, California, attending Tincher Elementary School, Walter B. Hill Jr. High, and Robert A. Millikan High School. He graduated from UCLA with a degree in Microbiology and now works for CSC in El Segundo. We have a dog named Emiko. 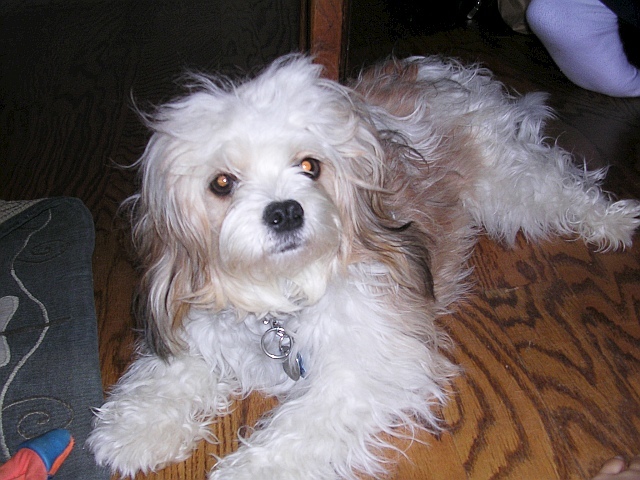 She is a Cavachon, which is a mix between a Cavalier King Charles Spaniel and a Bichon Frise. We acquired Emiko from a breeder in Iowa. 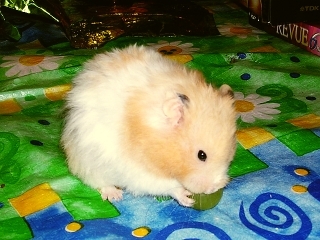 Our last pet before Emiko was a hamster named Daisy.